If you don’t have the physical copy of Metamorphosis and haven’t ever seen the pictures from the book, look at the image below. What type do you think this is? A monochromatic look? No line break? Maybe it’s some kind of classic, or even a dramatic. Nope. It’s the Soft Gamine makeover from the book. You may be asking, “But where is the line break? Where are the cute details and the Peter Pan collar?” It doesn’t fit in with the popular image of Soft Gamine at all. But it has crisp details (the shoulders), interesting accessories (big red bead necklace, little gloves), and there is, in fact, a line break. It does not obey the popular rule for short women that you should have your hosiery and your shoe be the same color to create the illusion of a longer leg. Kibbe himself, according to people who have seen him in person, seems to go back and forth on how useful the book is. Some he tells to ignore the book, some he tells to read it. 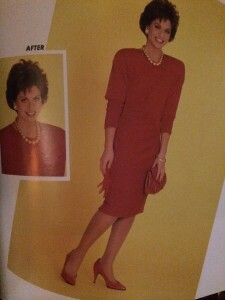 But while the recommendations can be outdated (I don’t buy sweaters with shoulder pads! ), I still find that the recommendations are very useful. It helps you understand the parameters of your type that you can do then use to create your own unique style. What I would definitely avoid doing, and I think I have mentioned this before, is relying on Pinterest and Polyvore to get an idea of the way your type should use their lines. Even with my own Pinterest, I’m not entirely satisfied with how I represent the types, because I feel like I know my own type the best and the rest I usually just repin from other people. We end up with stereotypes like Soft Gamine=Ingenue and that Soft Natural=Boho. People who come back from Kibbe with these types assigned to them do not end up dressed how the type is generally represented at all. I think that we tend to look at the types with a point of view that is too narrow. While there is debate in the Kibbe community right now about whether the book has any use at all, I think it’s still the best resource for understanding your type and the lines that it requires. Anybody else’s interpretation should only be considered once you have gotten to know your type well, and when you know what works or what doesn’t.